This week I won't be bringing an interview ,I will take a small time off . I will be back on December 4 -08 . Please continue to participate in my giveaway . Thank you and Happy Holiday. 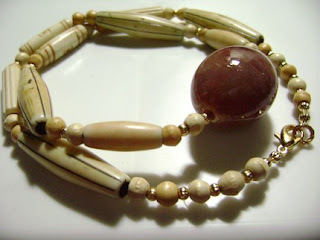 This are hand crafted one-of-a-kind pieces that comes signed and dated. I have sculpted and painted the tiny house and trees to resemble a winter scene. The winter scene was constructed out of Paper clay. The faux snow is a fusion of various glitters and some irridescent flakes . they are a great way to keep your tiny treasures in. The boxes, houses and trees were coated with glitter gloss varnish and are non-toxic. Tiny Willow Picking Rainbow Berrys In Fairyland Playset. This is one of my original hand crafted one-of-a-kind mixed media altered art piece . I have signed and dated each of the tiny pieces. It is a whimsical piece to be displayed in your home and will delight your heart and soul. 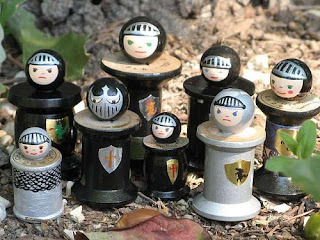 The pieces measure approximately from 4/6 to about 1 2/6 inches tall.The tiny box that Fairyland comes in is approximately 1 4/6 by 1 4/6 inches and the depth is about 4/6 inches. The tiny art pieces and the fairyland box were crafted using some of these embellishments: exotic papers, rhinestones, glass beads and other tiny treasures. was painted in a multitude of mediums. 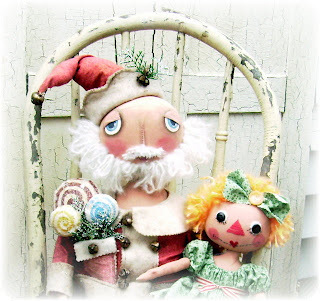 Labels: "playset" mytinystudio "folk art" paper cut doll "my tiny studio"
Cindy is the artist behind pywackit primitives. 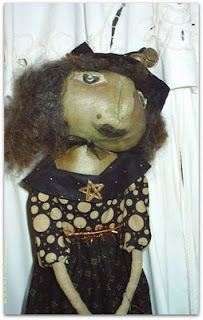 Her creations are not just dolls, but pieces of art that should be cherished. craftsmanship and the talent that she commands. I am extremely proud of the two pieces that I have from this amazing and talented artist. I asked Cindy three questions and these are her responses in her own words. What would you like others to know of you and your art ? That I love what I do. It comforts me somehow to create and sooths the soul. that I have created and it has brought smiles into their lives. really not like any other job I have ever had. Creating is a craving for me like a good chocolate bar or a cup of coffee. What advice or encouragement would you give to another artist ? I would have to say that it is so important to keep at it. to move on to another artist when they can't find your work. You have to make your work constantly available in order to build a following. Were can others find your art work or get to know more about you? For a bigger picture of past and current works you can visit my blog. Erica is the artist behind ericadaley. Her Spool Dollies have the charm and innocence of days gone by. They evoke your best childhood memories and may I say that little smile you would get as a child just knowing that you were playing with your favorite toys . I asked Erica three questions and these are her responses in her own words. What would you like others to know of you and your art? First, I love what I do. I find being creative has been a driving force in my life and I really just can’t help myself; its part of who I am. Although I have been inspired by many great artists, classic and contemporary alike, most of my own work is focused around children. I was a teacher for a long time and have truly enjoyed being a mother, so I think these two things have influenced me a great deal in my artistic expression. Additionally, it is hard to focus on more in depth projects when you are a mom, so craft art has been a wonderful way to be able to continue making things while giving me the freedom of setting down and picking up again without too much difficulty. What advice or encouragement would you give to another artist? Simply, follow your heart. It’s important to enjoy what you’re doing, and if you’re not, it might be time to make a change. Art often does not pay the bills, so continue to be creative in your free time, but work hard if you really want to make a goal come to fruition. Try to use ‘green’ products as much as possible – take care of the earth. Make friends with other artists! They can be of tremendous support and can give great advice. Where can others find your art work or get to know more about you? I have a web site ( http://www.ericadaley.com/ ), which also links to my shop at http://www.ericadaley.etsy.com/. Another place to not only see loads of my work, but also photos of myself and my family is at my Flickr page ( http://www.flickr.com/photos/29033862@N00/ ). 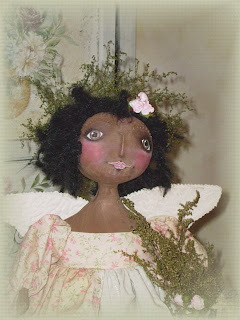 I also sell through a web store in Vermont at http://www.craftsburykids.com/, and at a store in the U.K. called White Doll Arts (http://www.whitedollarts.com/). And I will be at a few local craft fairs (in Southern Maryland) this Christmas 2008. I'm Vegetarian (for over 20 years now)My 'hero' is Pete Seeger for his passionate support of humanitarian causes, his political and environmental activism, his personal humility, and of course his music.I'm a stay-at-home mom, but before that I was a teacher and worked with children with special needs as well as preschool. I worked retail sales at Flax Art Supply in San Francisco. I've worked as a calligrapher, and I've been a nanny, among many other things.What I love: my family, the mountains/outdoors, the West Coast (my home), music, books/reading, food, and doing art of course.Don't Like: Ignorance, hate and violence, racism, and loud/angry voices.Hopes and Dreams: To make a good living at doing art, to be the only mom to my son and to be able to watch him grow up, and to grow old with my husband. 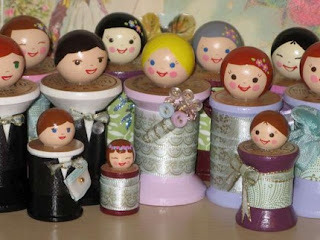 Labels: Interview : Meet The Artist Behind Ericadaley spool dolls doll wooden my tinystudio " my tiny studio "
Lynnie is the artist behind Addie Hattie Prims. Her prim unique style is refreshing and wonderful to look at. On her blog ( http://addiehattieprims.blogspot.com/ ) you can tell the passion Lynnie has for life, family and definitely for her art . I asked Lynnie three questions and these are her responses in her own words. I would like for them to know that each of my creations, are definitely mine. I use no patterns, just some times I will trace a body part, or clothing piece on newspaper and go from there, but mostly I just take the scissors and cut and sew. I have been creating ever since I was a little girl and I love it with a passion. Most of my inspiration comes to me in a fabric store. I just love all kinds of fabric and probably have too too much of it. I also get encouragement from family and friends. and I Thank the Good Lord for the gifts he has given me. Build a network, online, family, friends, co workers, neighbors, community. Get your name out there. Don't ever give up. You will have lows and highs, but don't ever give up your passion to create. On my personal blog you can read my profile and learn more about me. Johnnie is the artist behind Jonwen Jewelry. Her Jewelry style is Bohemian classy with a touch of Victorian Romans . wears her heart on her sleeve and her Jewelry reflects it. I asked Johnnie three questions and these are her responses in her own words. fun that I have ever had in my life. books on things that I wanted to learn to do and counted the days until I could retire. I had to retire early due to my health but that just means that I get to "play" and have "fun" for more years. and was not able to fight for it,I do not get full retirement benefits. Even though I need to sell my crafts very badly to make ends meet, I would still craft wheather I needed to sell or not !!! I have also enjoyed teaching others to do some of the crafts that I enjoy. and only then will I retire if I can't get anymore materials to work with. What advice would you give to another artist ? as we are experiencing right now the world economy does change. give them an ear full !!! Oh, dear. Did I just say all of that. Is that not the answer you wanted? I have a shop on Etsy where right now I am focusing on jewelry. Also I am trying to learn all about Flickr.com. I have some pictures there already and will be adding more in the next few days. Thank you so much for allowing me to talk about something that gives me such joy!!!!!! WSOAPP is rolling out the red carpet ! $50.00 cash prize giveaway , redeemable in any seller's shop . Prizes and cash giveaways in participating shops. Enter to win one original 4 by 6 inches canvas painting of a blue bird of happiness . No purchase necessary, nor will you pay for shipping or handling. It is absolutely free. Registration for the giveaway will be held through DEC. 10th 2008.
look on the side column for ( Register To Win A Painting ) Enter you first and last name, address and E-Mail . One entry per person and Email. Your information will not be sold or distributed . The winner will be announced on DEC. 12th . 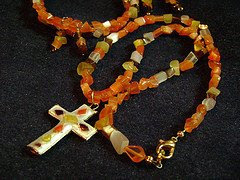 Winner's name and state will be posted on ( http://mytinystudio.blogspot.com/ ) . Winner will be contacted via E-mail prior to posting the results of the giveaway on the blog. Labels: Mytinystudio Free Giveaway " my tiny studio "
This is an original hand crafted mixed media altered art piece . The entire fairy garden is atop a small paper mache round box . The entire piece measures about 4 inches tall . There are 2 butterflies on wire that can be posed as you see fit . The charming vintage photo reprint is from my own personal collection and was painted in a multitude of mediums . I try to create each tiny piece as if you just happen to get a glimpse of a fairy garden . The stretched canvas measurements are 4 by 6 inches and 3/4 profile . The painting has a fine crackle antiqued look to it and it was finish off with a satin varnish. The sides of the painting have been painted . The canvas was also back stapled perfect for a frame-less display. Labels: mytinystudio "altered art" " folk art "" my tiny studio "
and both come signed and dated by me . The doll measures about 17 1/2 inches tall . The small saltbox house measures about 4 1/2 inches tall . stained and painted once more to give the pieces a wonderful vintage look and feel . The doll's body was hand-painted wearing a Shirtwaists and bloomers . I have added extra stitches on her body to give her a vintage look . and it is removable . The doll's dress neckline and hem were embellished with cotton lace . The dress is of cotton fabric with very old buttons . The hair is of wool, that I have dyed and hand stitched in place . The chair is not included . Thank you for looking . This are two original mixed media paintings . I have signed and dated the front , the back has been also signed , dated and titled . The stretched canvas measurements are 6 by 12 inches and 3/4 profile . The painting has a fine crackle antiqued look to it and it was finish off with a satin varnish . The sides of the painting have been painted . The canvas was also back stapled perfect for a frame-less display. unfortunately this week I won't be bringing you an interview. I will try very hard to get an artist for next week ( HOPE ). Thank you and I am very sorry .